Get the party started with this amazing Greek-style fried cheese ball recipe! Melting, oozing on the inside and with a wonderful golden brown crust on the outside, this fried cheese ball recipe is pure comfort! In Greece ‘Tirokroketes’ (fried cheese balls) is a very popular meze one can find in almost every tavern and is with no doubt my absolute favourite cheese appetiser (along with cheese saganaki!). So I was more than excited to finally come up with a fried cheese ball recipe that tastes even better than the ones I ate at my favourite Greek taverns! Try out this super easy fried cheese ball recipe and indulge yourself to that little sin..
Fried cheese ball recipe – How to make the perfect, melty cheese balls! Although this Greek fried cheese ball recipe is really simple to prepare, in order to achieve that beautiful crispy golden brown crust with the amazingly melty cheese filling, you have to pay attention to the details. First of all it’s best to make the mixture for the cheese balls in advance and let it stand in the fridge for 45 minutes, until firm enough to be able to form the mixture into balls. For extra melty texture and flavour, this fried cheese ball recipe calls for three different kinds of cheese: tangy flavoured Greek feta cheese, soft and sweet Gouda and salty mature cheddar cheese. Feel free to improvise and add any kind of herbs you like; fresh dill or mint, will surely give a Mediterranean twist on your plate.When it comes to coating less is more; so this fried cheese ball uses plain good old-fashioned flour. Dredge the cheese balls in flour, shaking off any excess; this will form a light crust on your cheese balls. And now for the most important part: the frying itself! Use some clean oil for frying and heat it on medium high heat, just before it starts smoking. Check if your oil is ready by sprinkling just a small pinch of flour in the oil; if it starts bubbling the oil is ready. Hot oil can be really dangerous, so use a slotted spoon to carefully place the cheese balls inside the hot oil. 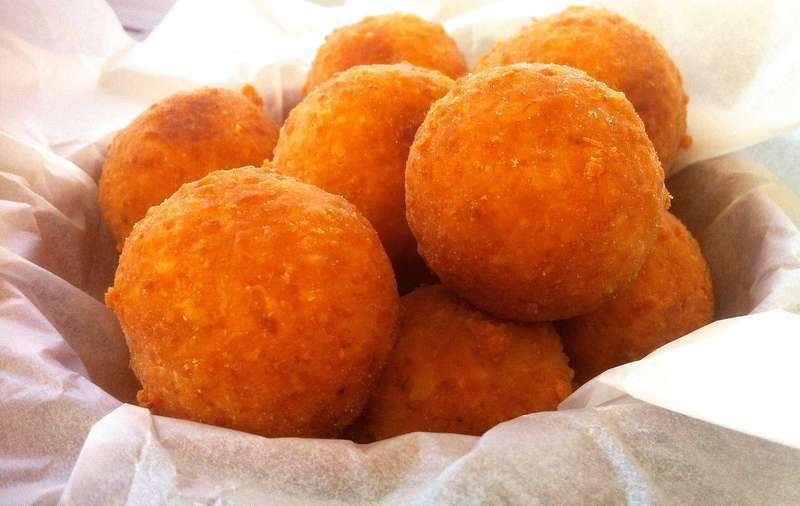 To achieve the perfect result, deep fry the cheese balls in a single layer. Not overcrowding the pan is vital for crispier results. If you add too many, the temperature of the oil will decrease, resulting into absorbing too much oil and becoming soggy. Place the cheese balls sparsely in the pan, without sticking one to another. Turn the cheese balls often in the pan and adjust the heat to avoid burning until they have a formed a rich golden brown crust. So go ahead give this fried cheese ball recipe a try and amaze your friends and family. Enjoy your cheese balls while still hot with a last minute squeeze of a lemon! Oh and you can always read this delicious recipe in Greek here Τραγανές Τυροκροκέτες με φέτα συνταγή. To prepare these delicious fried cheese ball recipe, add all the ingredients into a medium bowl, season well with freshly ground pepper and blend to combine. Cover the bowl with some plastic wrap and place in the fridge for 45 minutes. This will help the mixture for the cheese balls to firm up a bit and make it easier to roll into balls. Form the mixture into little cheese balls (this mixture is enough for 14-15 cheese balls) and dredge in some flour shaking off any excess. Serve the cheese balls while still hot with a squeeze of a lemon. Enjoy! Can you recommend any other cheese/cheeses in place of feta and goats cheese? Hi Sadie, probably Mascarpone or ricotta but would use about 50 grams and add some extra hard Parmesan to make up for the reduced texture. I love these! I always eat them at my local greek restaurant but couldn’t figure out what kind of cheese they were made of. I guessed the feta cheese, of course, but I wouldn’t dare to improvise them. Thank you for sharing, I never found such a recipe. I live in Italy and cheddar and gouda cheese aren’t easily found, do you think I could substitute them with gruyère or something like that? Hi Laura, thank you for your great feedback! Any hard, mature yellow cheese would do (just not halloumi as it will not melt). By the way, love your website! I did this recipe yesterday and the cheese balls turned out perfect. My kids and hubby loved them. It brings memories from my childhood, when my grandma used to cook. Can these be made in advance and reheated before eating? I made these and they were melting and breaking apart while frying. I don’t know if this was due to using olive oil for frying or if the heat was too high? Would a combination of mozzarella, feta and parmesan work? I like the meltiness of the mozzarella, plus its mild flavor is a good counter for the feta and parm. Let me know. THanks for an awesome recipe! Tried these, they are delicious. I did have some trouble frying them. If the crust is to thin, the cheese will burst out of the shell. Solved this by soaking them in egg (after dredging in flour) and then in breadcrumb. They will be a lot firmer and easier to fry! What is 1.5 ounces of flour, in terms of teaspoons, or something else I can easily measure?